v. Fresh recruits (departmental/inter-departmental) who joined PMAD on or after 31-12-2016. 02. Please ensure the payment to the beneficiaries before 18-05-2017. The transfrees who have recently joined your organization may also be considered subject to provision of undertaking that they have not received the subject remuneration from their previous Controller Office. 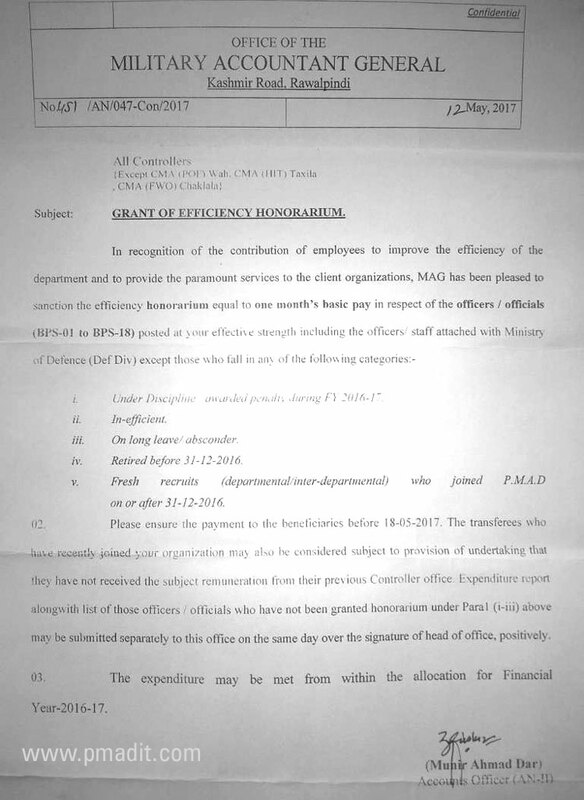 Expenditure report alongwith list of those officers/officials who have not been granted honorarium under Para-I (i-iii) above may be submitted separately to this office on the same day over the signature of head of office, positively. 03. The expenditure may be met from within the allocation for Financial Year-2016-17. what about employees of PAC Kamra. Are they entitle of the increment under the provision of the OM of MAG dated 12 May. 2017. Dear if they are permanent employees of Pakistan Military Accounts Department.